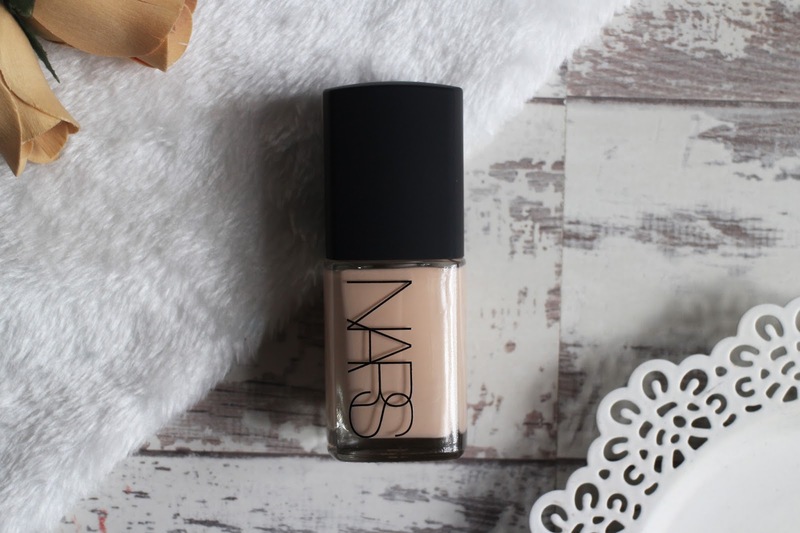 The Nars Sheer Glow Foundation is one that has been well loved and highly praised in the beauty world and it's remained at the very top of my beauty wish list for the longest time but i just never got round to buying it. However, i was determined to treat myself to the hyped up holy grail foundation during my trip to London back in September and finally discover what all the fuss was about! I bought my foundation from House of Fraser and a very lovely lady helped me find which shade matched me. I don't normally enjoy being matched to foundations at counters, i find it can be quite intimidating but this lady was really lovely, she picked out 3 shades that were closest to my skin tone, applied them to my jawline and told me to pick which i felt was the best match and we both agreed on the same one which was Mont Blanc - i believe this is the second lightest shade in the range, the bottle says 'Light 2' which after some research means light with pink undertones. I do like the packaging for this, the glass bottle is nice and simple but it just baffles me that it still doesn't come with a pump, i can only begin to imagine the mess that I'd make having to pour the foundation out, so there was no way i couldn't buy a pump to go with it. The first few weeks after buying this, i avoided using it because i was worried that this product I'd been pining for, for so long might not live up to this massive hype and the expectations i had for it. I don't know if you've ever had that moment when you trying something new whether it's a clothing item, a make up product or even a food item but it's just love at first sight - i know that sounds a bit dramatic but after i applied this, i genuinely couldn't stop staring at my reflection because my base looked so good - i even messaged my friend just to tell her how good it looked. It was everything i wanted it to be and more. As i mentioned earlier, i was matched to the shade Mont Blanc and it matches my skin tone perfectly. Out of every foundation I've ever used i honestly don't think I've had one match me as perfectly as this does. It's described as being a medium to full coverage, I'd say its more medium as it's not quite as heavy i was expecting but it covers everything i need it to, it doesn't feel heavy or cakey and gives you a even and flawless base with a luminous and glowy finish. Personally, I've mostly applied this with the Real Techniques Beauty Sponge and i find i get the best results with that, it blends out beautifully and effortlessly. 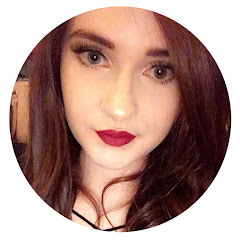 I have tried it with a foundation brush which worked just as well, it gives a little heavier coverage with a brush but it definitely takes a little more effort to blend in than a sponge does but you still get that same gorgeous finish. I like to wear a primer underneath my foundation - i'm currently using The Ordinary High Spreadability Fluid Primer which is amazing and I do like to set my foundation with a powder, mostly in my t-zone to prevent any shine but i find this lasts on me pretty well, i mostly save this foundation to wear on nights out and special occasions and every time it's lasted throughout the entire night perfectly. 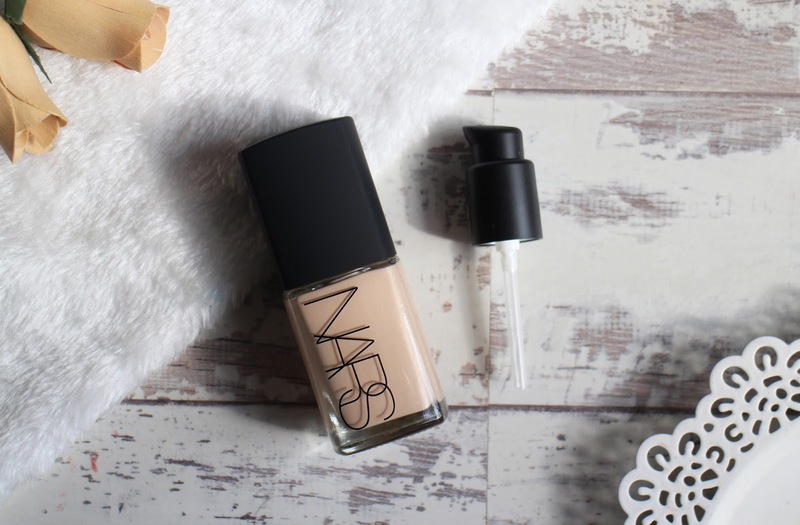 Nars Sheer Glow retails for £33; which is not the cheapest of foundations and if you buy the pump too, it another £3-4 on top of that so it's definitely more of a splurge product. Having tried it, i don't think i could imagine not having it in my collection and i would happily pay that amount because for me it's worth every penny - i completely understand the hype behind it and aside from the lack of pump, i don't have a single bad thing to say about this foundation. I adore how it makes my skin look; it gives me that really healthy, natural glow to the skin and every time i use it my base is flawless. I've tried a lot of foundations and loved many of them, but i think this might be holy grail material.